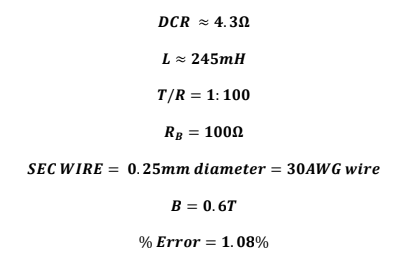 In order to design a current sense transformer you need to determine the DCR of the SEC, the inductance of the SEC, the SEC wire area/gauge to use, the magnetic area of the core, the excitation current, the % error of the CT and the desired output voltage for a given input current. Let’s start by assuming you will use a toroid as the form. 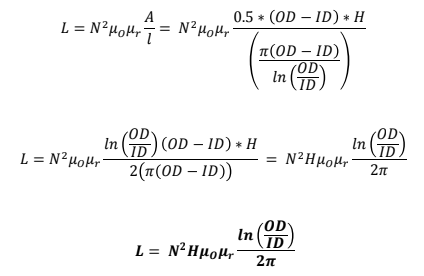 This above equation sets the path length around the toroid using the OD, ID and height, H. It is a function of the number of turns, N, the resistivity of copper, rho, and is inversely a function of the wire’s cross sectional area, Aw. Let’s make another assumption here. Let’s set the cross sectional area equal to the current divided by 2,000,000. We do this because this sets the current density in the wire to 2A/mm^2. This is a safe assumption to use when determining the needed cross sectional area of the wire. Here Is is the SEC current, with the PRI current being that going through the 1T of wire inserted through the ID of the toroid. A few more formulas need to be developed…..
Let’s find one that determines the needed core area to avoid core saturation….. 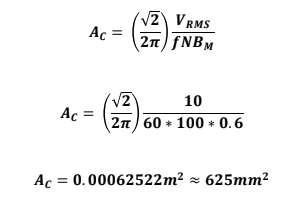 In the above equation Bm is the MAX flux density of the core. You can set this to whatever you’d like below the cores actual MAX flux density. The SEC current is a function of the turns ratio, which means it will range from 10mA to 0.1A with a 1:100 turns ratio. Since 0.1A would be the MAX current we will choose a SEC wire area/gauge that can handle this based on our formula given initially. Let’s find the needed core area. Let’s use a frequency of 60Hz. For this frequency we can use a tape wound GOSS toroid. Let’s set the MAX flux density to say 0.6T. This core can handle more but we will just use this value. So this is fine in this respect. Now before we move on let’s be sure it can fit 100T’s of 0.25mm wire inside of it leaving room for the PRI wire to be inserted. Now you can spec all of this and either make the CT yourself or know better what to look for off the shelf. NOW THIS CURRENT SENSE TRANSFORMER CAN LIKELY SENSE UP TO ABOUT 30A BECAUSE WE SET THE FLUX DENSITY TO 0.6T WHEN THE CORE CAN LIKELY HANDLE UP TO ABOUT 1.8T. THE SEC WINDING MAY GET WARM/HOT THOUGH IF CURRENTS THIS HIGH ARE SENSED FOR ANY SIGNIFICANT PERIOD OF TIME.